This is the season for Christmas! 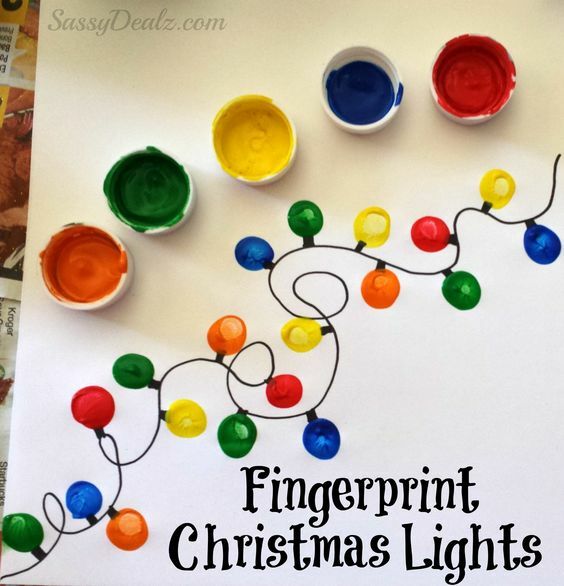 There are a variety of Christmas crafts that you can make by yourself. 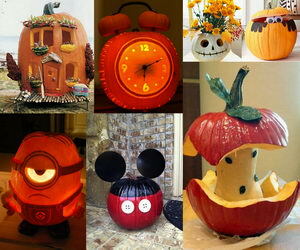 They require simple materials that you have lying around your house. Teach your kids how to make Christmas crafts so that they can be part of the decoration activity in your home. This would heighten their creative and would spark a need to be innovative. Check out these easy and cute DIY Christmas crafts that I have compiled to illustrate how they are made and how they look like. Use the ones that suit your taste. 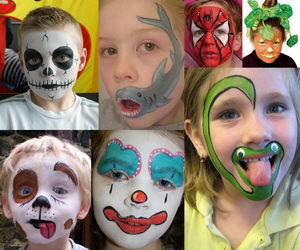 You could soil your hands in paint now and then, but you are guaranteed to have fun. 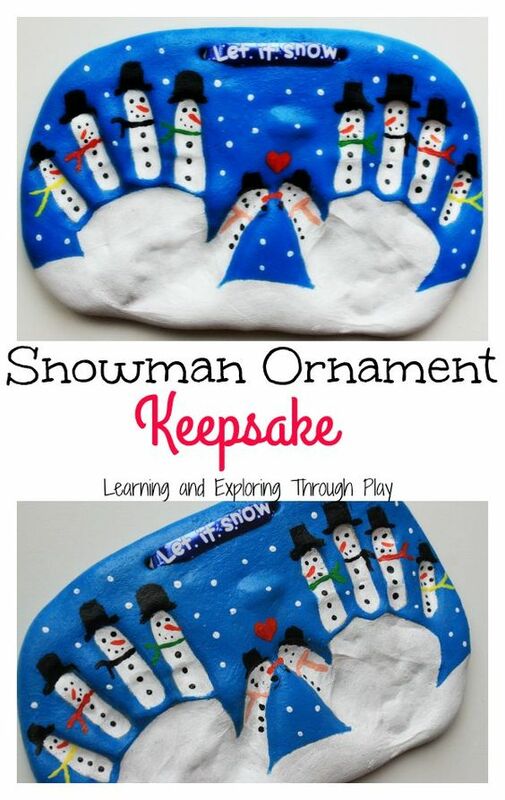 These crafts have impressions of Christmas tree ornaments which are created by dipping fingertips into acrylic paint and pressing on to the dough. 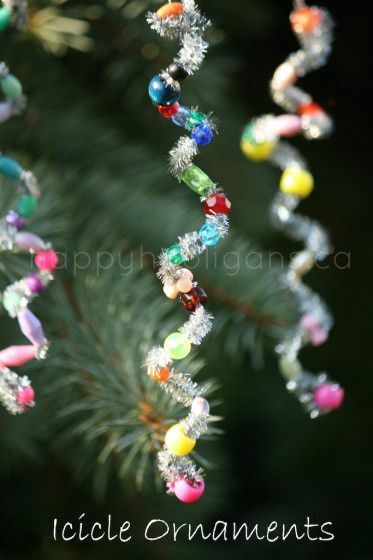 Multi-colored threads are slipped into the punched holes at the top of your trees. When the trees are dry and ready, you could hang them wherever you see fit. The trees look like candy hanging on multi-colored threads. These trees are cute and make your home look like a scene from a fairy tale. via messylittlemonster. These Christmas trees take the shape of a 3-dimensional cone once complete. 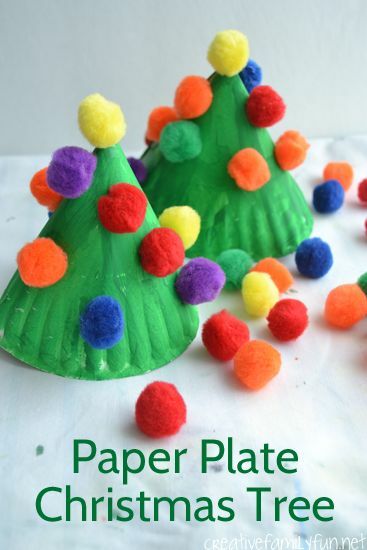 They are made of paper plates, a clear tape, some green paint, glue and multi-colored sponges known as pom poms. A three-quarter paper plate is curved into a cone and sealed with tape on the inside. The outer surface of the cones is painted green. Pom poms are stuck all over the cone giving the impression of Christmas tree balls. 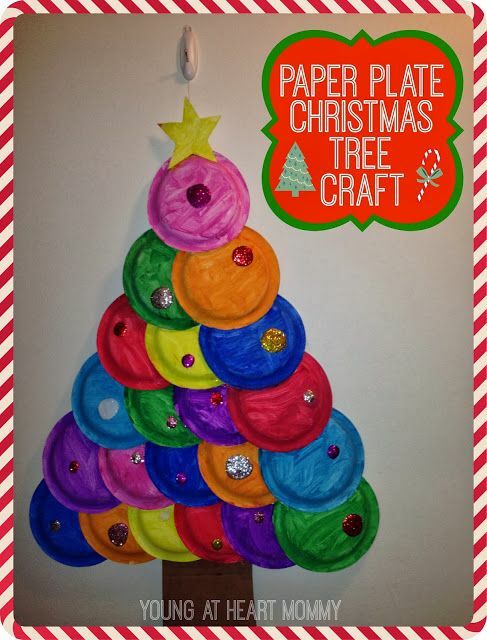 Your paper plate Christmas trees can be placed on a table or next to the fireplace. via creativefamilyfun. To make the salt dough snowman you will require a bigger batch of salt dough that can fit both of your hands stretched out. Unlike the salt dough fingerprints Christmas tree, this one is not painted. It has on it the shape of hands that were pressed into the dough. The outside of the dough that border the fingers and palm impressions are painted to mimic a snow falling background. The finger impressions are the snowmen. 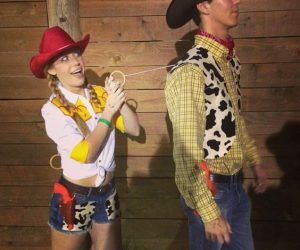 They are painted to look like they are dressed up. They have black hats on their heads, eyes, carrot noses, and funky ties. A tag is added on top of the dough with words such as ‘let it snow’ or ‘it’s Christmas again.’ Kids are guaranteed to love it! via learningandexploringthroughplay. White Paint is rolled on to open palm and fingers. When grasped, the white fingerprint paint on the balls would look like snowmen sticking out from below. The snowmen are created by painting black eyes, noses, and mouths on their heads. Materials that look like scarfs are attached to their necks. The remaining quarter sections of your paper plates should not be disposed of. 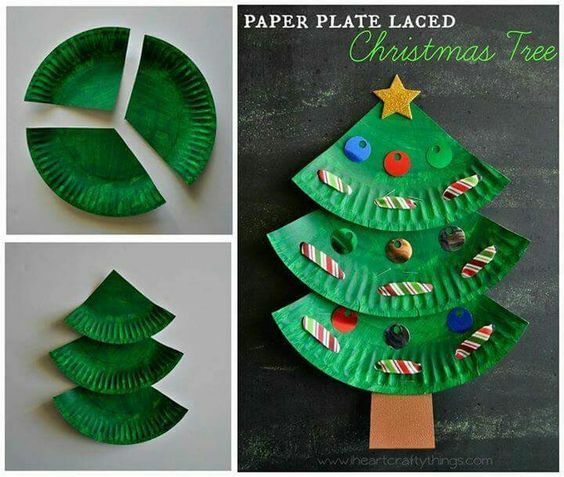 They would come in handy in making paper plate Christmas tree crafts. Up to three of them can be layered together on a flat surface. Using pins, you would stick them together and punch holes in them severally to weave colorful threads through them. 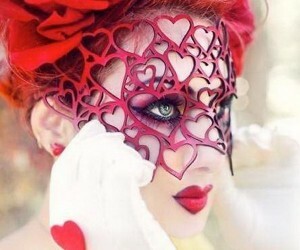 Their green surfaces would then be laced with anything that looks cute; small pieces of paper shaped like a heart, plastic with the impression of gemstones, practically anything. 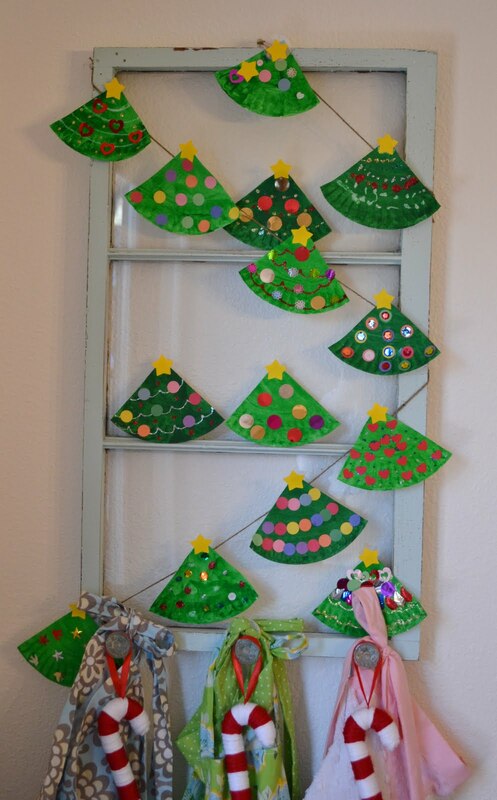 Stick the tree crafts on your walls with masking tape underneath. via iheartcraftythings. The candy cane Christmas trees are made of green felts that are supported by candy canes pin-woven on the back. The felts are cut out in the shape of Christmas trees. The lower part of the candy cane sticks out at the bottom of the tree like a trunk. Ornaments such as stars, paper, and plastic in the form of various shapes are glued onto the surfaces of the trees. via momontimeout. 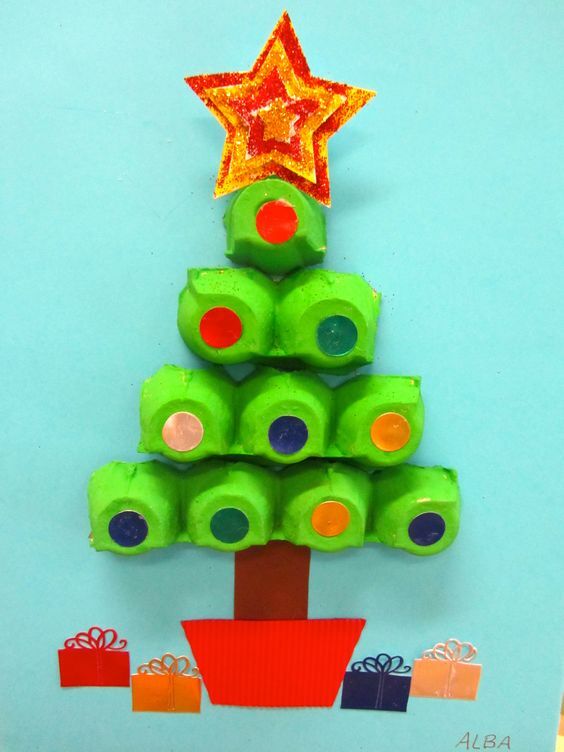 These Christmas tree crafts use 3 Popsicle sticks attached at their ends with glue to form a triangular shape. Their outlines are then decorated with tiny pom poms, buttons, glitter and pretty much anything that would add color to them. They can even be woven with glitter ribbons in a circular motion from the top to the base. A star is pinned on to the top, and a thread is added in the form of a loop for hanging. via onelittleproject. The trees are made of toilet paper tubes that are rolled out in the structure of a spring. They are painted with green paint on the inside and the outside. Yellow stars are pinned on their tops, and gold glitter is smeared on their outer surfaces. You will need to step about a dozen of them on the floor or table corner since they look good by the numbers. They look like a forest of fir Christmas trees. via eideducacioinfantil. Wreaths are very welcoming when pinned on your door. 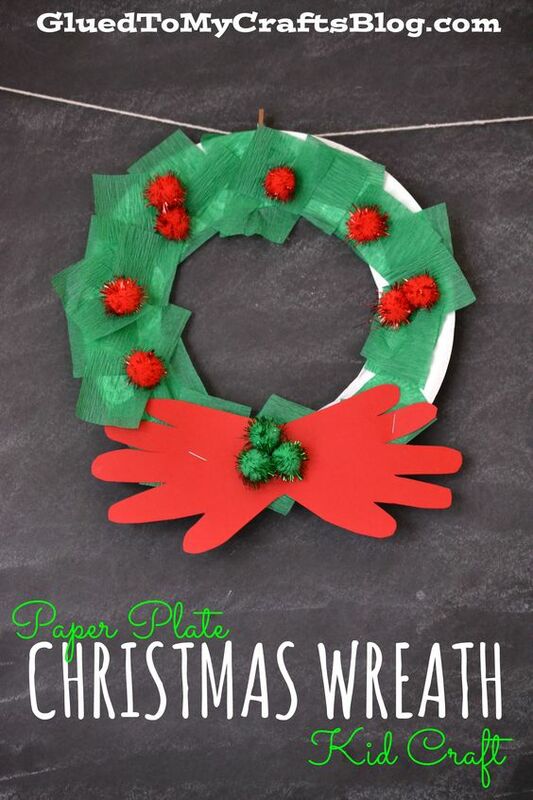 Paper plate Christmas wreaths have a huge circular hollow cut out from a paper plate. The ring is painted in green then neatly decorated with a bow on top and red and white fluffy balls. 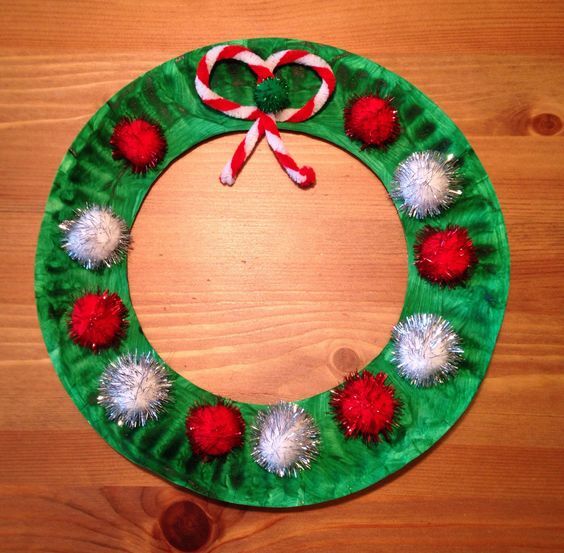 The decorations are glued or stapled onto the wreath. These Christmas tree crafts are entirely made of paper plates. They look like Christmas trees with giant balls that block the tree leaves and branches. Gold or yellow star is pinned on their tops to complete the look. via youngatheartmommy. This Christmas craft is almost entirely made of egg cartons. The top part is only consisting of one egg carton section with a star added just above it. The stem of the tree is made of brown cardboard dipped into a basket. More decorations in the form of small multi-coloured basket shaped papers are littered around the floor of the tree to add color. via diybastelideen. 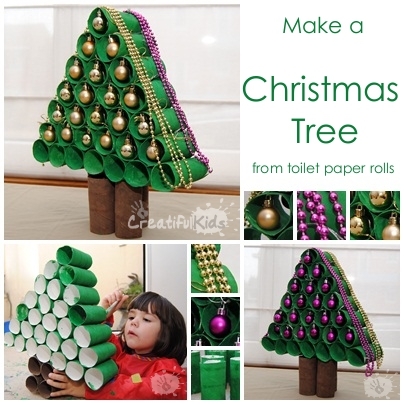 This craft takes up to 32 toilet paper rolls for a single tree. The rolls are painted green and the hollow interiors of the rolls are decorated by hooking small Christmas tree balls on at their inner upper surfaces. 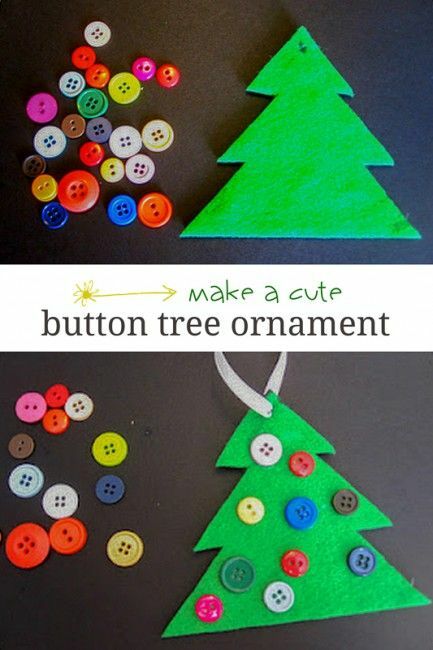 You could decorate the trees on both sides with different colors of ornaments to give your craft a changing color effect. via creatifulkids. 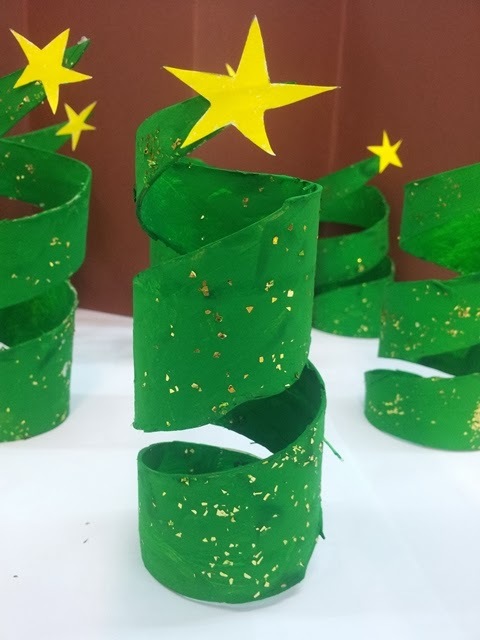 This Christmas craft is composed of quarter wedge-shaped paper plates painted in green and hanged on a zigzagging thread. Each paper plates is decorated differently. Some with circle papers of different colors while others smeared with glitter with yellow stars pinned on their tops. The thread is zigzagged around windows or doors. via 1pureheart. This is one of the easiest craft to make. They are made of cones of pine trees painted green. They look like miniature Christmas trees. Small balls, beaded and metallic chains and glitter threads are laced around the cones. Round batches of molding clay painted in white are used as the foundations for the pine cone trees. via elementaryartfun. A toilet paper roll is painted red with black line breaks to look like a chimney. Two piles of cardboard complete with shoes shaped bottoms are fitted into the chimney to give the impression of Santa close hanging upside down. Paper in the shape of Santa’s black bag of goodies is pinned onto the side of the chimney. via craftymorning. The yarn is the main ingredient in this Christmas tree craft. Cardboard cut in the shape of an acute triangle is wrapped with multi-coloured yarn until it becomes puffy. Button Stars are fitted onto their tops, and a loop of thread attached to the stars are used to hang the trees. Beads, buttons or small balls are attached to threads as decorations. via stylowi. The Christmas tree light garland resembles glowing Christmas light bulbs. The bulbs are made of cardstock of different bright colors. The bulb shapes are achieved by folding the cardstocks and holding both ends tightly between the thumb and forefinger. The bent side is the pressed onto the palm of the hands to from a temporary bow shape. When released, they look like skewed squares. The edges are stapled together and inserted into circular hollow cardboards with punched holes. Sisal threads go into and out of the holes connecting all the bulbs. 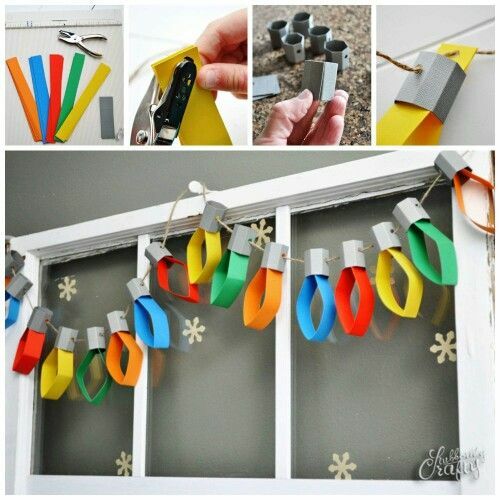 These Christmas light crafts are hanged on to door and window shades. via stubbornlycrafty. The surfaces of these button trees are made of green felt, foam sheet and buttons. The green felt is cut into the shape of a Christmas tree the glued onto the foam sheet. Buttons of various sizes and colors are then glued on the green felt. The buttons look like Christmas tree balls. The trees are hanged by their punched tops using white ribbons. via handsonaswegrow. The canes are made of alternating red and white beads inserted into thick green fluffy threads. They are then curved on the top to give them a candy cane look. This craft looks like a snowman against a blue background sky with falling snow. The background is achieved by painting the surface of thin cardboard in blue with bold white circles all over to resemble snow. The snowman’ outline is entirely made of marshmallows. There are three circular shapes stuck onto one another with the top one acting as the head. Paper eyes are added at the center of the head, and a carrot is painted in place of the nose. Two sticks are attached to the mid-section to act like hands. The snowman wears a tilted black hat. via jugglingactmama. This craft looks like many hands sticking out of a Christmas tree. What makes it even more interesting is the photo images of people attached on to the hand prints. 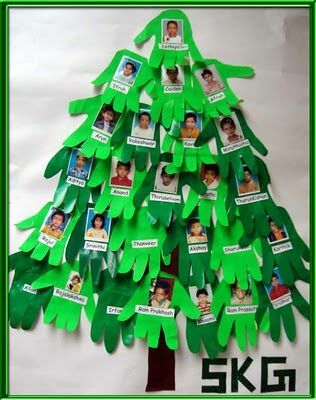 The handprints are made of green paper cut into the shape of the palm and fingers. The trees can be used to catalog all the members of the family, class or any social group that are spending Christmas together. via blogspot. This wreath craft looks like a bunch of green bow ties hanging in the air. The bow ties are noodles painted green. A red ribbon is tied at the bottom of the wreath to give it a classy look. via craftymorning. The paper strips glued to a triangular shaped cardboard give the trees a multi-layered look. Many shades of green, crisscrossing white colored strips give the impression of snow stuck onto the trees during winter. Therefore the trees look like they are constantly in the way of a steady wind. via handimania. The clothes spin or otherwise known as pegs look like snowmen hanging on tightropes by their heads. Multi-colored ribbons are tied to their mid-sections to look like scarfs. Puffy orange noses are attached to the clothespins and impressions of eyes and noses repainted at their sides. via easypeasyandfun. No colors or adjustment are required. The clear plastic balls are stuffed with the same types of ornaments. 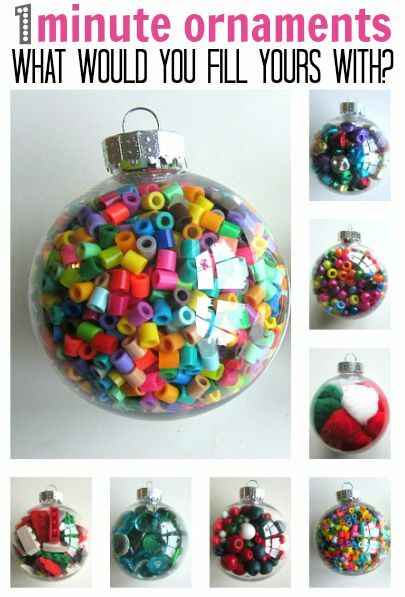 You could stuff them with beads, painted stones, Legos, marbles or even buttons. When hung on Christmas trees they shade colored light to the surrounding objects. via notimeforflashcards. The crafts look like picket fences that just came to life. Popsicles are stuck together side by side using glue then eyes, nose, and mouths are painted on to them. They could be made to look like Olafs, Santa Claus or any other cartoon character you have in mind. via craftionary. The icicle ornaments look like hanging silver springs. 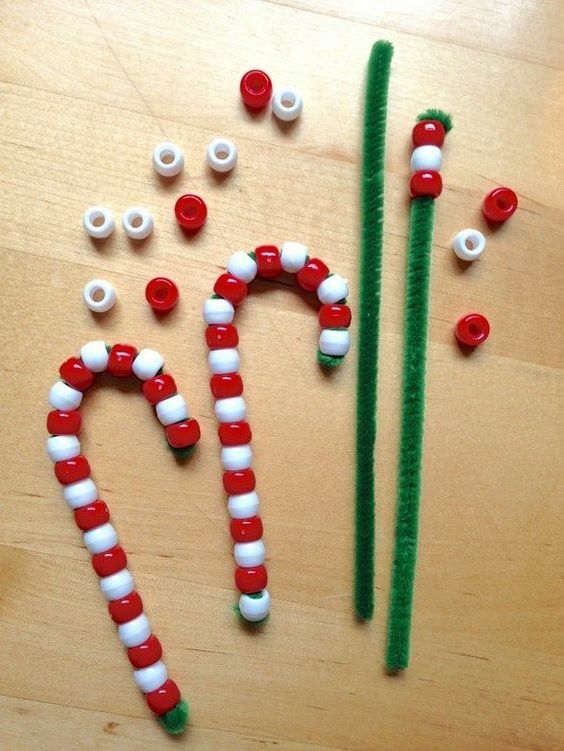 You can make them easily by inserting beads into pipe cleaners. The beads make them stretch out and dangle up and down when pulled. via happyhooligans. 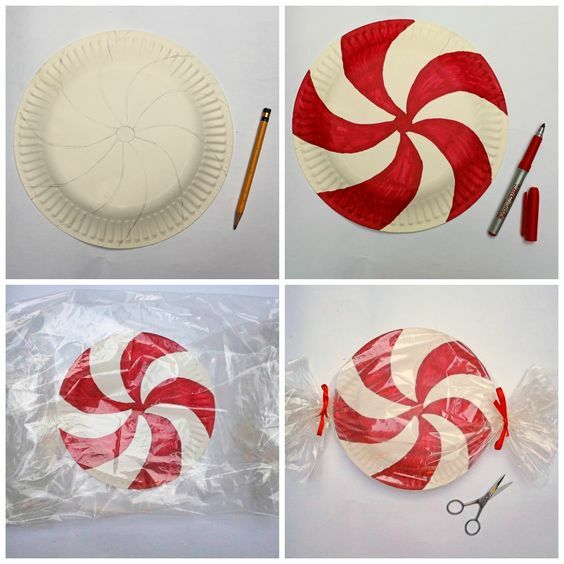 Paper plates are painted in the impression of red rotating fans. Transparent plastic bags are used to warp the plates. The result looks like giant peppermints. via thejoyoffashionblog. To make this craft, the borax is cut into short pieces and attached to each other. They look like fallen snowflakes. You could dip your snowflakes in freezing water overnight and have an even more convincing icy versions. Hang them on your freezer, walls or just smear them on the floor. via agirlandaboy. These cards look like a reindeer just popped out of your foot. They are hilarious. They are made by creating a footprint on a white sheet of paper. Use a small child foot that has stepped onto some brown paint. Each piece is completed with black reindeer horns. via emmaowl. These crafts look like miniature pine trees. When decorated with buttons of different colors they look like Christmas trees with Christmas balls on them. The cinnamon sticks give the tree trunks a natural brown color and the cinnamon leaves look like tree branches hanging out. via consumercrafts. Three white bottles caps form the body of one snowman. They are made to stand straight using a red ribbon that is glued underneath them. They resemble snowmen in the background of pitch black night sky. via oneartsymama. Fingers are dipped into paint and then pressed onto a white sheet of paper. You can now go ahead to draw a black curly line that connects all the light bulb together and supplies them with electric current. via craftymorning. 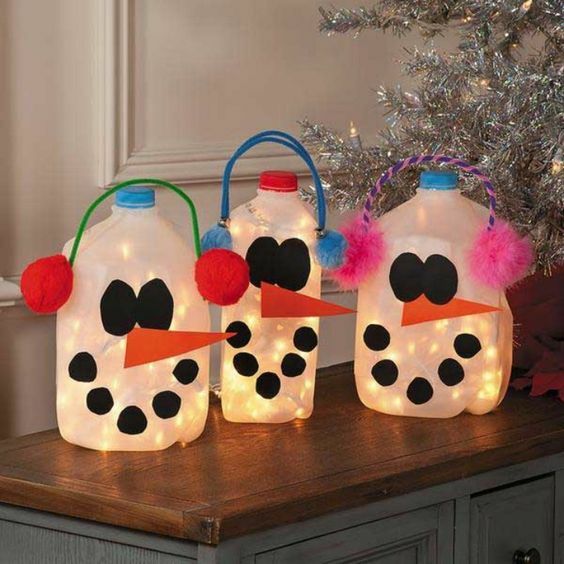 The jars complete with eyes, nose and mouth and headphone look like fat snowmen listening to music. Do not paint the milk jars, sine it will be hard to wipe out the color. Use cut out the paper in the color and shape you want. via freefunchristmas. Get tins of various sizes and paint them green on their outer surfaces. When stuck on to one another, the tins look like a towering Christmas tree. Place pom poms and threads all around the tins and a star on the top to complete your look. via babbledabbledo. 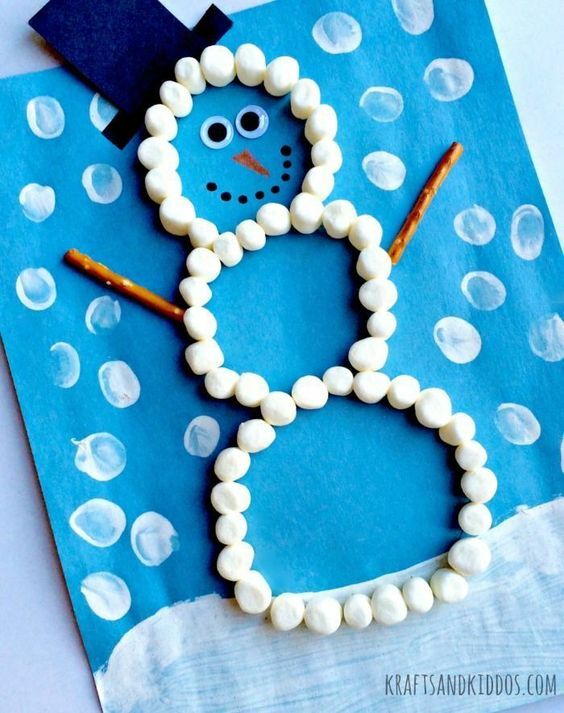 The Q tip snowman is made of many Q tips which are stuck into white puffy balls and it’s so easy to DIY. The sticks in the place of the eyes and nose are painted in black so that they would stand out. via polki. These look like ninja turtle with double punched ribbons to expose the eyes. If your kid is a fan of ninja turtles, they will love these crafts. via thecraftingchicks. 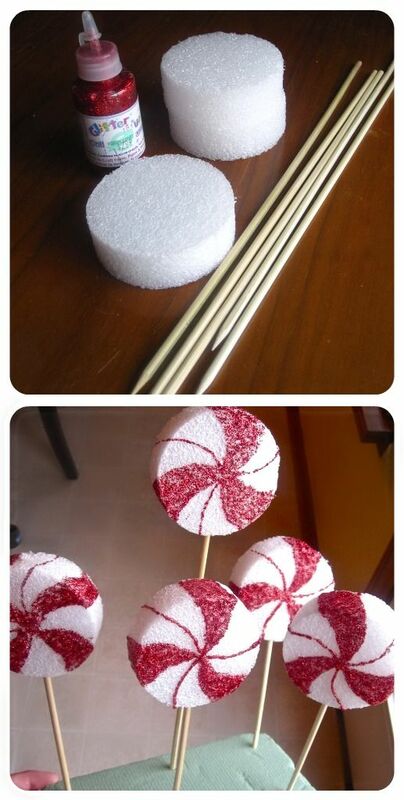 The cotton balls are used in this craft to mimic Santa’s white beards. The eyes and nose are painted on the plate to reveal Santa’s face. The top part of Santa’s head is in red to look like Santa’s hat. via acultivatednest. The red painted Styrofoam look like peppermint lollipops sticking out their handles. The red color is painted onto the Styrofoam in rotating fan-like shapes, and sticks are pinned into them. They look so real that kids could even be tempted to lick. via thesimplylivingblog.